It is our human tendency to seek blame for such tragedies. Since tornados are such chaotic forces that we struggle to understand or predict, we tend to see God as the instigator of such storms. After all, God is the sovereign Lord of the universe, naming every star and directing their path (Psalm 147:4). Certainly God controls the path of every tornado? Christians have argued this question for generations. My perspective is that in creating the universe, God released this world from strict determinism and gave us and the creation some freedom and control. God gave dominion over creation to humanity (Genesis 1:28). God loves the world, interacts with the world, redeems the world, but has chosen not to “control” the world like some gigantic computer game. In Mark 4:35-41, Jesus and the disciples climbed into a boat to cross the Sea of Galilee. Jesus fell asleep while a great windstorm arose and the boat nearly swamped. The disciples panicked in the storm. Some Christians believe that God should steer us around the storms, should protect us from such violent destruction. In a sense, we believe God should wrap us in a kind of spiritual “bubble-wrap” that will protect us from all harm. The disciples awaken Jesus with a question, “Teacher, do you not care that we are perishing?” Jesus then rebuked the wind, “Peace! Be still!” Jesus has the power to still the storm, but more often he stills the storm of doubt and confusion in our hearts. God’s deepest and truest plan is for us to trust Jesus, in the midst of storms and doubts. Tornados will continue to disrupt creation. Like the tsunami in Japan, the best response of Christians is to love our neighbor in need, to bring tangible compassion to the people. One way to respond is the ELCA disaster relief. Such love is certainly part of God’s plan for creation. How do you see God in the midst of such suffering? 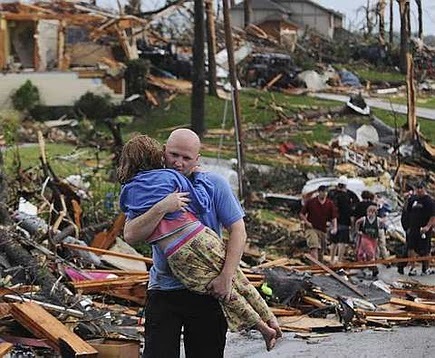 Lord Jesus, bring healing and hope to those devastated by this week’s tornados. This entry was posted in Bible, Jesus, theology, trust, Uncategorized and tagged Mark 4, tornado on May 25, 2011 by Pastor John Keller.